Since my last report, the Phillies have played 2 games against the Yankees, 2 against the Blue Jays, and 3 intrasquad games. I attended 4 of the seven, I’ll give you what I’ve got here. I love these games. You get to see a lot of the young guys, most of whom don’t see the field during the games against the Blue Jays and Yankees. The problem is that I find it difficult tracking all the players. Line ups aren’t provided and I have to figure out batting orders and positions for both teams as they bat/take the field. Sometimes it can take three innings to get the order since they run situational settings at the start of most innings. runners on first and third. There were a lot of sacrifices attempted. Attempted, not very many successful. Five of the 14 runners who started out on base scored, only 2 on base hits, and one on a sacrifice fly. One scored on a wild pitch and the other on a horribly botched rundown. The runner who actually reached base and came around to score advanced on a SB and WP, and scored on another WP. They should stress these situations more (and probably do in the morning sessions). Better keep at it. The botched rundown came in the fifth with runners on first and third. Jhailyn Ortiz intentionally broke for second and stopped between the bases. The pitcher took a step or two toward Ortiz and threw to second while Ortiz was stationary before he committed to a base. The ball was thrown to first and back to second where Ortiz was tagged out, just barely. The runner from third scored without a throw. Heck, he never even drew a look. Pitchers seeing action were – Denny Martinez, Gustavo Armas, Oscar marcelino, Justin Miller, Rafael Carvajal, Manuel Silva, Julian Garcia, Sandro Rosario, Jake Kelzer, and Jesus De Los Santos. Position players were – Jose Tortolero 2B, Keudy Bocio 3B, Aaron Brown CF, Jhailyn Ortiz RF, Josh Tobias 3B, Luis Encarnacion 1B, Juan Aparacio C, Nicolas Torres SS, Simon Muzziotti CF, Malvin Matos RF, Cornelius Randolph LF, Darick Hall 1B, Luke Williams 3B, Cole Stobbe SS, Brayan Gonzalez SS, Jesus Henriquez 2B, Brett Barbier C.
DH – Edgar Cabral, Danny Martinelli, Henri Lartigue. I only recorded 4 hits, all singles – an RBI infield single by Randolph, and line drive singles by Lartigue, Brown, and Tortolero. Julian Garcia struck out 2 batters in his one inning. Including Garcia’s two, the pitchers combined to strike out 5 batters. These games run three plus hours. I chose to not travel to Tampa. Rush hour traffic back across the Causeway is atrocious. The Pirates cancelled and the Phillies played an intrasquad game. I hadn’t planned on traveling to Bradenton for the game. Nobody knew about the intrasquad game until the next day. Somewhat of a disappointment. Made me glad that I missed the games the previous two days. The AFL guys were taking innings and at bats from the young guys. Three pitchers (Brandon Leibrandt, Victor Arano, and Jeff Singer) and three position players (Scott Kingery, Mitch Walding, and Aaron Brown) who are headed to Arizona pitched and played. Josh Tobias, who is going to Columbia to play winter ball, was also in the line up. Rodolfo Duran at the plate. Aaron Brown made a diving catch in the first inning. Brown continues to play great defense. Carlos Alonso coached first base. Josh Tobias displays a quick bat and gets down the line pretty good. Batting left-handed, Tobias lashed a double to RF. 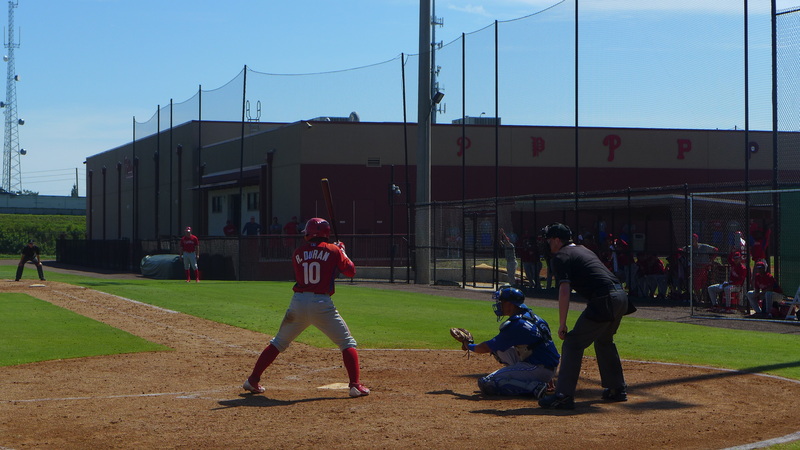 Rodolfo Duran lined a two-run, bases-loaded double to right to give the Phillies the lead. Nick Fanti pitched the final two innings (Leibrandt pitched the first two). Fanti struck out three batters, got two ground outs, and a pop up. He gave up a one-out double. He got all three fastballs swinging at fastballs. I got velo on two – 88 and 89 mph. This was a good game. Kingery and Walding were still in the line up. We faced a Blue Jays line up that included Anthony Alford, Danny Jansen, Ryan Mcbroom, Bo Bichette, and Vladimir Guerrero. Passed on the traffic, game went 3-plus hours, but missed Sanchez. All the AFL guys and Tobias are gone. One infield looked like this – Catcher, Juan Aparacio; First Base, Greg Pickett; Second Base, Nicolas Torres; Shortstop, Jose Tortolero; and Third Base, Keudy Bocio. Cole Stobbe played third for the other team. Joey Curletta was on hand and batted late in the game. Rafael Marchan came in late at catcher. The following pitchers appeared – Jordan Kurokawa, Justin Miller, Denny Martinez, Oscar Marcelino, Gustavo Armas, Julian Garcia, Sandro Rosario, Jesus De Los Santos, and Jose Nin. Brett Barbier hit a grand slam to left early in the game. 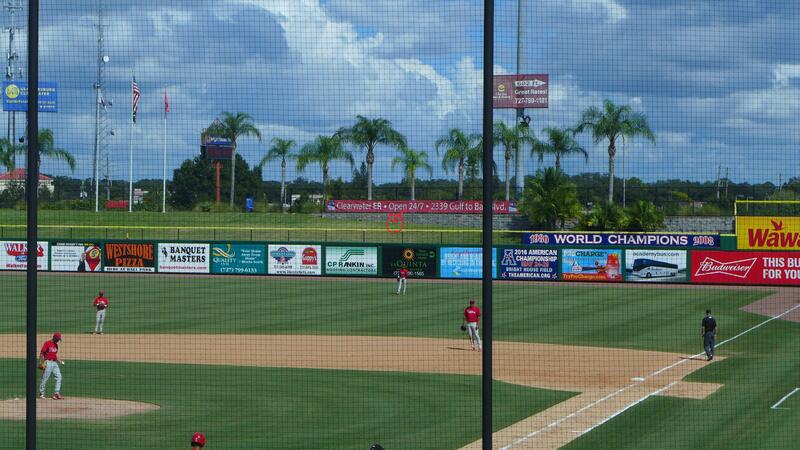 Gregg Pickett, who has appeared to be searching for his timing, crushed a HR to the RF berm, see picture. Pickett’s HR landed under the “O” of open on the red banner. Marked by circle/arrow. Most innings began with runners on base again. Once again, the innings that started with runners on first and third revealed that the pitchers and infielders involved need to practice. Pitchers are throwing to second too early and runners are scoring from third with out throws again. 10/3 – Phillies recalled Elvis Araujo from Lehigh Valley IronPigs. 10/3 – Phillies recalled Jimmy Cordero from Lehigh Valley IronPigs. 10/3 – Phillies recalled David Buchanan from Lehigh Valley IronPigs. 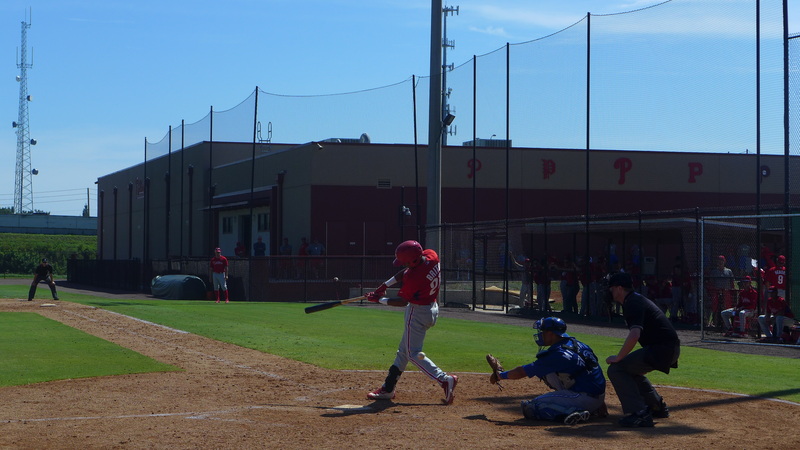 10/3 – Phillies recalled Dalier Hinojosa from Lehigh Valley IronPigs. All players in the org have been activated off the 7/15-day DLs. Greg Pickett and Leonardo Colagrossi has been activated off the 60-day DL. Thanks for the update. Any Moniak news? I ask the same question last week, either we are being ingnored or nobody knows anything. A buck forty now ,hopefully Jim long gone by now. Be safe Jim God bless you, listen since you have your own sports channel. You should your own you tube announcers 1 suggest Romus and Roccom. Your impressions of ss Bryan Gonzalez, the 2016 signee. Was in the MLB Top 25 but was pushed out by all the added Cuban defectors. SSS. Gonzalez looks capable in the few innings and at bats he has gotten down here. But all the young. LA middle infielders look capable. If one or two advance as quickly from this seaon to next (like Danniel Brito has this season) that would be nice. Right now, Jonathan Guzman seems to be the MI they like most. He gets innings against the Yanks and Jays. I like to see what positions guys are playing in Instructs. Sometimes it’s just to see how the player does but sometimes it means the player has been moved. Tobias back to 3b? Pickett to 1b? Stobbe to 3b? Walding to 3b? Walding is probably just to expand his capabilities but the others could be real moves. Jim, any players stand out to you? Rodolfo Duran. The young catcher seems to take advantage of the at bats he gets. Has the propensity to block balls in the dirt so that they bounce in front of him. Yesterday, threw a guy out at third on a ball that he blocked up the third base line. I could go on and on with positive opinions on a dozen or so kids. Maybe I’ll do that next week. But Duran jumps of the page more than the others. not a zirconia however a real diamond!